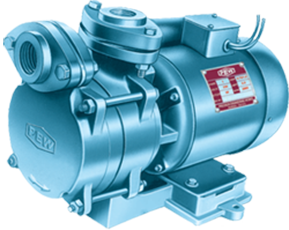 "PEW" self priming pumps are tough, reliable & meant for rugged use in domestic applications. They are best suited for high suction lift up to 8 meters and can also perform suction from long horizontal distances due to their centripetal impellar design. Max. Discharge - 125 Lpm. Max. Suction depth – 8 m.
When water is to be got from long horizontal distances. When a foot valve is not an integral part of the system. Residential apartments/ industrial estates/ hospitals/ hotels/ schools, etc,. Water supply to elevated locations.